Valentine’s Day has passed us by again, and now it’s time to do our best to ignore that flashy 50% off sign dangling just above aisles of chocolate-filled hearts. February is American Heart Month, so instead of those shiny boxes, let’s focus on another heart: the one that really does keep us alive. There is no simple pill that we can take to keep us healthy, but luckily many of the foods that are abundant in the world are full of nutrients that can help nurture a healthier body. When it comes to eating for health, simple, unprocessed foods are the best answer. While science and medicine cannot directly link certain foods to the prevention of heart disease, these foods contribute to a healthy system overall. What Nutrients Do We Need? If you already eat a diet based on whole foods and “eat the rainbow”, you’re likely already getting the key nutrients you need for your body to run smoothly. The prevalence of processed oils in the Standard American Diet has resulted in an overabundance of omega-6 fatty acids in our bodies, but in order for our metabolisms to work effectively, we need to have omega-3s as well. These natural fatty acids are found in oily fish such as salmon and sardines, and in chia seeds, flax, and walnuts. This mineral, found in leafy greens, spices, grains, and tofu, is essential to human development, helping with the transport of energy between cells. Magnesium is also thought to help with calcium absorption. Vitamin E can help against free radical damage and the oxidation of cells. It has also been shown to improve skin, nails, and hair. Vitamin E can be found in leafy greens, avocados, broccoli, and sweet potatoes. Fiber can reduce blood cholesterol levels, improve mineral absorption, and of course, help keep the excretory system running smoothly. Fermented soluble fibers have additional benefits, as the fermentation produces short-chain fatty acids that can aid in stabilizing blood glucose and reduce the synthesis of cholesterol by the liver. Natural fibers are found in a variety of foods, including legumes, oats, berries, and sweet potatoes. This easy and gluten-free Coconut-Lime Tofu & Rice packs a nutritional punch, but you won’t even notice. Feel free to add chiles to spice up the meal, but the simple sweetness of the broth helps to make it a hit with kids and other wary eaters. This gluten-free dish is reminiscent of tom kha soup, though much simpler in flavor. Feel free to add chiles, though the sweetness of the dish makes it a hit with kids. While rice is cooking, heat a large flat-bottomed saucepan over medium heat. Slice tofu into chunks (I like to do triangles) and arrange in saucepan. Gently press on tofu to release excess water. Whisk together brown sugar, soy sauce, and lime juice until sugar has dissolved. Mix into coconut milk, then add liquid to tofu. Bring to a boil and let simmer about 10 minutes. Add tomatoes, green onion, and greens. Cover and let simmer another 5-10 minutes, until greens have wilted and are bright in color. Do you think about the health benefits when preparing your food? What’s your favorite “heart healthy” dish? Mmm such a tasty sounding dish! Coconut lime great flavors, with tofu too healthy. Sounds like a great combination. This recipe sounds delicious. I think about the health benefits of almost every meal I make. Many people think that preparing healthy, whole foods is expensive, but they fail to count the cost in low energy, low productivity, and the high price of health care. I feel like spending more of our hard-earned dollars on healthy foods is an excellent way to save money and have a better life. 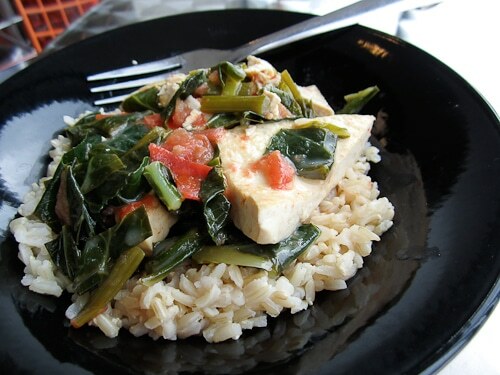 Tofu is not my family’s favorite, but I think I’ll have to give this recipe a try! These, too, are my favorite flavor pairings with tofu. A little sweet, a little salty, a little tangy – it’s why I love Thai food so much! Awesome recipe. I love tofu and loved the recipe you shared. Thanks for pointing out the nutritional values as well. Hope you had a great valentine. The perfect recipe for Meatless Monday! Love the coconut lime sauce. Definitely going to try this! Thanks for the easy “print” button. This sounds marvelous! I simply adore tofu, and I love the flavors of coconut milk and lime. I can’t wait to try this with my family! Have you ever tried it with other vegetables? We aren’t especially fond of cooked greens, but I think some carrots, broccoli, and cauliflower would be tasty. This looks like a good, simple weekday stir-fry, we often serve something similar, though I’ve never put a bunch of greens in. It’s always good to figure out how to get in more greens, and they cook down so much that you can get a lot of them into a dish. I like to slice the tofu in triangles, too. If I have time to get fancy, pressing and marinating the tofu beforehand is nice.